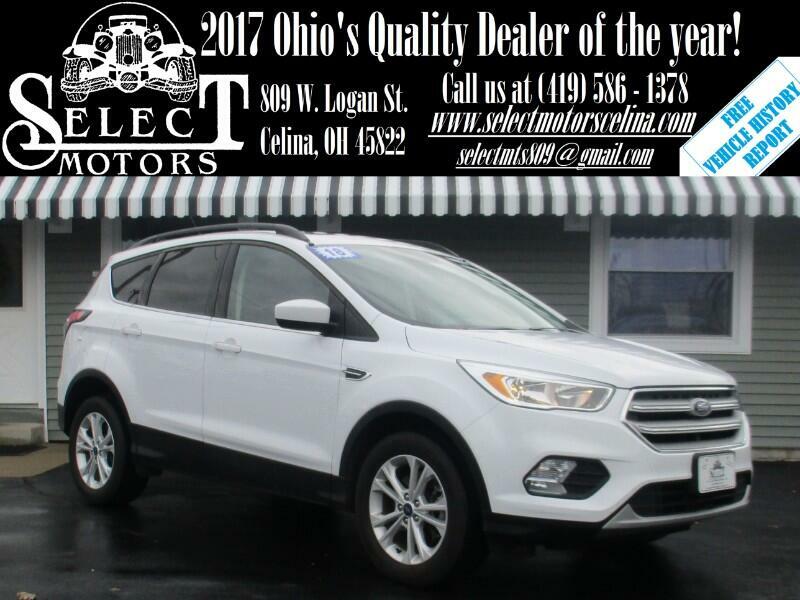 ***TXT US @: (419) 362 - 6200*** 4WD, Dual Vista moon roof, Heated cloth, backup camera, power seat with power lumbar, automatic headlights, dual automatic climate control, power windows/locks/mirrors,keyless entry, AM/FM, SiriusXM, Bluetooth, tilt and telescopic steering wheel, cruise control, information center, 17" alloy wheels. Fuel Economy: 22 city / 28 hwy. Warranties: Balance of Ford's 3 year or 36,000 mile bumper to bumper and 5 year or 60,000 mile powertrain. In service date: 12/05/2017. Extended service contracts available. For 2018, the Escape offers a new SEL trim level that comes with features such as a power liftgate, leather upholstery and the Sync 3 tech interface. Ford has also revised the availability of a few other safety and convenience features on the Escape this year. Unfortunately, the turbocharged 2.0-liter engine is now only available on the top Titanium trim level. The 2018 Escape is a compact crossover SUV that comes in S, SE, SEL and Titanium trim levels. The S is fairly bare-bones, so we expect most buyers will want to start their search with an SE, which offers an upgraded engine, nicer wheels, a power-adjustable driver seat and more available options. The new-for-2018 SEL trim level adds more convenience features while the top-trim Titanium adds luxury touches and an even more powerful engine. The S starts with a 2.5-liter four-cylinder engine (168 horsepower, 170 pound-feet of torque), a six-speed automatic transmission and front-wheel drive. Standard features include 17-inch steel wheels, automatic headlights, MyKey parental controls, cruise control, air-conditioning, a tilt-and-telescoping steering wheel, a height-adjustable driver seat, a 60/40-split folding and reclining rear seat, a 4.2-inch central display, a rearview camera, the Sync tech interface with AppLink smartphone integration, Bluetooth, and a six-speaker sound system with a CD player and a USB port. Note that this model is generally aimed at business fleet buyers and may not be easy to find on your local dealer's lot. Upgrading to the SE adds 17-inch alloy wheels (optional on the S), added chrome exterior trim, sound-reducing window glass, a turbocharged 1.5-liter engine (179 hp, 177 lb-ft), roof rails, foglights, a keyless entry keypad, rear privacy glass, dual-zone automatic climate control, steering-wheel-mounted paddle shifters, rear air vents, an eight-way power-adjustable driver seat (with power lumbar adjustment), heated front seats, upgraded cloth upholstery, a rear center armrest and satellite radio. Optional on the SE is all-wheel drive and a Sport Appearance package that adds black 19-inch wheels, black-painted exterior trim, LED daytime running lights, paddle shifters, partial leather upholstery, and a leather-wrapped steering wheel and shift knob. The optional Sync 3 tech package includes an 8-inch touchscreen, enhanced voice controls, Apple CarPlay and Android Auto, Sync Connect (includes remote app services and onboard Wi-Fi) and a nine-speaker sound system with dual USB ports. A panoramic sunroof, roof rail crossbars, a navigation system, and a tow package rated up to 2,000 pounds are also optional.